At ASC, we believe that investing in children is the only way out of the destructive cycle of poverty and underdevelopment. In Uganda, 55% of children under 5 live in poverty, which is why we have long been involved in children's projects there. 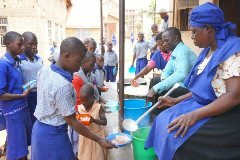 Our projects in Uganda include schools, homes, community outreach, feeding programs and vocational training. The first project we would like to introduce to you is located in Zana, a poor community ouside of Kampala, that has a very high number of AIDS orphans, many of whom are fending for themselves. 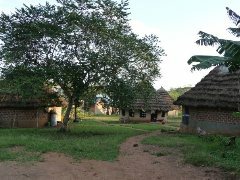 Zana Community Children’s Center in Uganda is ‘home’ to over 500 children. While most of the children don’t actually live at the school, for many this is the only home they know. The majority of students are orphans. Some may have a frail grandparent left, some were taken in by neighbors or friends, and some live on their own, often caring for younger siblings. All of them come from extremely poor backgrounds where regular meals, medicine, schooling, even a clean shirt or a warm blanket are luxuries. At Zana the kids get all that and a lot more – they get to be children who laugh, play and dream of the future, grow up in a caring community with friends and adult mentors, and receive a solid education on which to build their future. With the school located in one of the poorest communities in the area, just on the outskirts of Kampala, it is a daily struggle for the leadership at Zana to meet all the kids physical, mental and emotional needs. But all you see when you visit is a beautiful campus and a beehive of curious, excited kids. In the bustle, you might miss the fact that the teaching materials are hand-made, that the students don’t have books, and that the teachers work mostly with paper, pencils and their imagination. We saw pictures of the human heart hand-drawn and labeled, charts of plants or the stars cut out and pasted on construction paper, posters of tools and animals copied from a textbook. After providing food for them - which is absolutely essential because most kids eat their only two meals of the day at school - and paying for staff and teachers, there is simply no money left for text books, story books, dictionaries, maps, or other educational materials. Please meet Christopher at his home: His story is typical for the children who go to Zana. Christopher is an orphan who was taken in by a kind but very poor family. He sleeps on a damp dirt floor and makes clay stoves to support himself. Until he was found by outreach volunteers from the Zana Community Center, he had never gone to school. 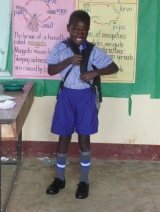 And this is Christopher in his uniform at Zana Community School beaming with joy for his biggest dream has come true – he is finally going to school. He still lives in the same place and he still makes clay stoves, but he is getting an education, regular meals and with that a whole new perspective on life. There are over 500 children at Zana, all from similar backgrounds – poor children, some with families, some without, all without a future unless they get help like Christopher. Please help us help more children like these! 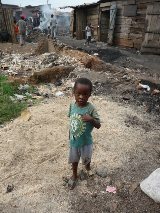 Street Children: There are about 10,000 street children in Kampala, Uganda. Some spend the day in the streets begging; they return home at night with a few pennies to help support their families. However, many are orphans without a home, a family, regular meals or schooling. They live from day to day, without hope or any prospects for the future – unless they get a chance to escape the misery of the street. 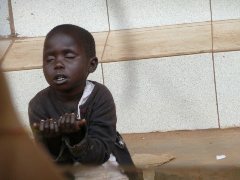 Slum children: This little boy lives in one of the slums around Kampala. There are no schools or playgrounds, clean drinking water or sanitation. Open sewers run through the slum and kids play with trash instead of toys. During the rainy season the sewage canals overflow and the rushing water masses pose a serious threat to small children. Caleb, our project partner, grew up in a slum himself. He spent his days in the streets begging, going through trash and trying to survive somehow. A kind stranger rescued him and gave him the chance to get an education. Now it is his mission in life to give back and rescue as many children off the streets as he can. Keeping His Promise: Over the last few years Caleb has been developing a holistic approach to solving the street children crisis in his home town. This includes the basics like homes where street children find love and care in a family-like setting, where they go to school, do chores and play with their friends, just like ‘normal’ kids. They learn that they are valued and deserving of a chance. In addition, Caleb has built strong relationships with government agencies to facilitate reuniting former street children with extended family as well as adoption of some of the children who have no-one left. The children who grow up at his home often stay on as mentors to the younger children or to work the land that Caleb has acquired in efforts to become self-sustaining in the future. Recognizing the need for continued guidance and professional training for young adults, Caleb has also started planning for a vocational training institute and commercial farm. And last but not least, Caleb helps young single mothers leave the slum, learn a trade and provide their children with a safe home, healthy food and an education to make sure they don’t end up in the streets and the cycle of abuse, neglect and crushing poverty repeats itself in the next generation. It’s amazing to see what Caleb has been able to accomplish in just a few years, but we must not forget that there is a lot more to do! 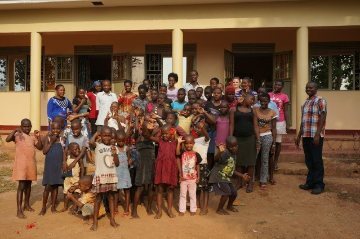 Almost 200 children live at New Hope’s Kasana Children’s Center in Uganda. Most of these children are AIDS orphans and don’t have any family left that can provide for them. At Kasana, the children live in family groups of about 25 children each. They live with their “family parents” on 5 acres of land that they use for food production. The family-based environment allows the children to grow up with a strong sense of self, security and belonging that they can draw on when they leave and start their own families. 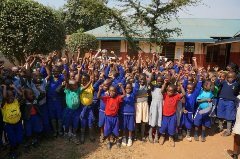 In addition to the children who live full time at the Kasana Children’s Center, there are more than 400 children who get an education at New Hope Uganda’s three schools. 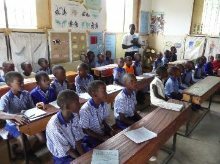 At Essuubi Eppya Vocational Primary School the youngest students receive a free education, vocational training, discipleship, love, food and medical care. New Hope Academy, the secondary school prepares older students for university or marketable trades, and the New Hope Vocational Institute provides business training and valuable job skills for young adults. 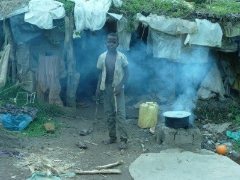 Consider helping secure the future for a Ugandan child.